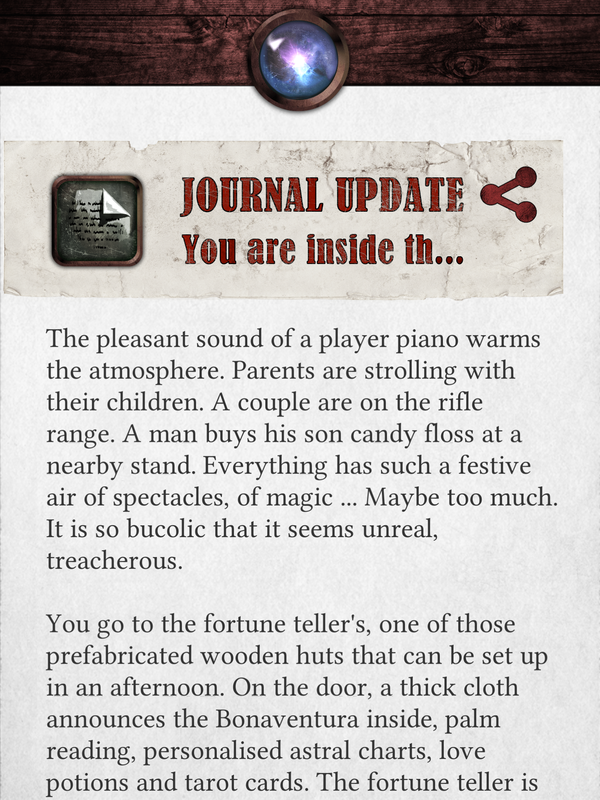 Cubus Games is a maker of gamebook apps, and they have released a version of Necklace of Skulls by Dave Morris as well as a game called The Sinister Fairground. In both cases, I felt that the UI was a bit clumsy and a bit unpolished, compared with the sleekness of 80 Days and inkle’s other work, or the splashy dynamism of Tin Man Games’ Appointment with FEAR. When you encounter new objects in the text — things that you might write down as keywords in a paper gamebook — you have to tick off a checkbox to acknowledge them as part of your inventory. I didn’t realize this in my first playthrough of Necklace of Skulls and got really confused about why I seemed to be missing objects that the text said I possessed; and indeed it’s not quite clear to me why it’s useful to make the player do this. Along the same lines, the navigation through the helper pages for Necklace of Skulls (map, items, journal, checkpoint, table of contents) had me thoroughly confused and tapping in circles: there isn’t a clear hierarchy of how these pages relate to one another, and the icons and back buttons don’t all do quite what I would have expected. Likewise, UI elements sometimes feel out of proportion, with text or icons the wrong size for one another: for instance, this “journal update” allows you to see only a fragment of what is being updated, while consuming a substantial amount of the readable area. The text in The Sinister Fairground also seemed a bit big on my iPad — perhaps the font sizes were chosen to account for the proportions of a phone, instead? And there can be a disconcertingly long pause after making a selection in Necklace of Skulls, which sometimes had me wondering whether my tap had really registered at all. There are some good touches as well, though. 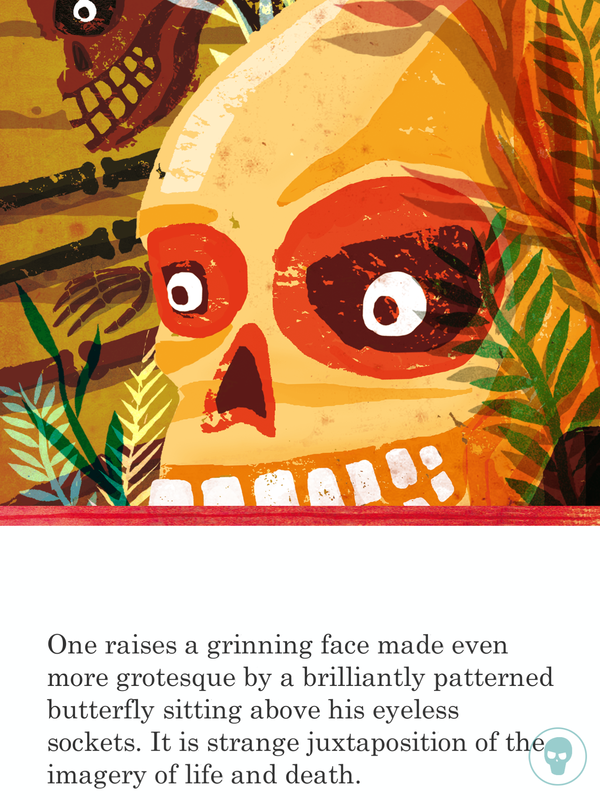 The art for Necklace of Skulls is colorful and evocative, with just a few enlivening animations to give them energy. The map for The Sinister Fairground provides easy navigation through the related stages of the story. Even with the bits I found suboptimal, I’d infinitely rather be playing these apps than working my way through a Kindle gamebook edition. In terms of overall play, they’re quite different experiences. Sinister Fairground is definitely intended to be viewed primarily as a puzzle rather than a story. Its locations function as self-contained stages, each of which is individually scored after you’ve played through, and while there is an arc narrative about looking for your girlfriend, most of the content in individual locations is gross-out horror stuff. Inventory items abound, to such an extent that the shop of weapons and potions and miscellany can feel overwhelming. There are quite a few insta-death possibilities, but also some set-piece riddles and puzzles that require you to type the correct key word. In any case, having read Frankenstein first, I was half expecting something literary and character-focused, but Necklace of Skulls is definitely an adventure book. You are a young man or woman in a Mayan kingdom. Your brother has been lost and you must go look for him, and along the way you encounter a number of folkloric creatures and a journey to the land of the dead. I’m not familiar enough with Mayan lore to say anything about the authenticity of these elements, but they felt creepy and surprising, a welcome change from western fantasy standbys. Necklace of Skulls is a fairly substantial piece. I played five or six times and never actually won, though I think I got close, and in each case there was pretty significant variation in my experience of the midgame. It’s possible to take several different routes on your journey to look for your brother (picking up, of course, a wide range of codewords and inventory items along the way). In the late game, this can yield satisfyingly fairy-tale payoffs in which creatures you earlier helped came to your rescue, or mysterious gifts from elderly peasants turn out to be the basis of an ingenious bit of self-rescue. There’s a special combat system for Necklace of Skulls, in which you pick a series of moves (defend, attack, rest) and then the result of these choices depends on what your opponent has chosen to do at the same time. I don’t know that it was possible really to guess what the other guy was going to do, though, so all this felt pretty arbitrary to me. Fortunately, combats came along fairly seldom relative to other aspects of the story; but I would not have minded doing away with them entirely. This entry was posted in CYOA, gamebooks, interactive fiction, mobile platforms, Reviews by Emily Short. Bookmark the permalink.